Here at Litter-Robot, we’re not ones to pass judgment on the latest diets. If you’ve found a regimen that works for you, congratulations! However, we do want to impress upon pet parents that just because a certain diet has helped you lose weight doesn’t mean it’s safe for your, um, chunky cat. 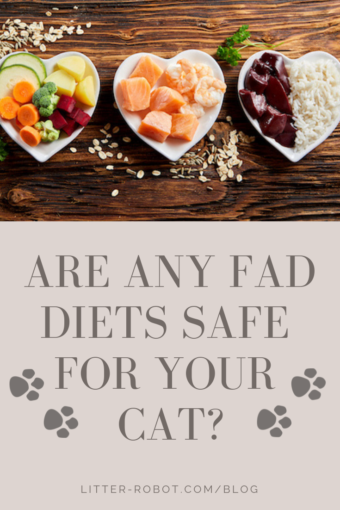 From gluten-free and paleo to raw food and keto, let’s take a look at some recent fad diets and whether your cat can safely partake. The paleo diet, also known as the Stone Age or caveman diet, requires the consumption of foods that were presumably eaten during the Paleolithic era (approximately 2.5 million to 10,000 years ago). Basically, you limit your food intake to that which could be obtained by hunting and gathering: lean meats, fish, vegetables, nuts, and seeds. The diet avoids foods that were introduced when farming was established some 10,000 years ago, such as dairy, grains, and legumes. Is the paleo diet safe for cats? Some aspects of the paleo diet are ideal for felines, including the consumption of lean meats (such as chicken and turkey, skin removed) and fish (such as salmon). However, you’ll want to make sure the meat is plain (unseasoned) and cooked thoroughly. Cats aren’t usually interested in fruits and vegetables, but serving some here and there won’t hurt—just be sure to avoid grapes, raisins, garlic, and onions. Skip the nuts and seeds, as some are harmful to cats, and those that aren’t are likely high in fat and salt content. A gluten-free diet excludes the protein gluten (surprise, surprise), including wheat, rye, and barley. For the 1 percent of the human population that has celiac disease, it’s critical to follow a gluten-free diet. Other people may have a sensitivity to gluten, which causes discomfort such as stomach pain and bloating following the consumption of the protein. Still others partake in this fad diet because it’s trendy. Is a gluten-free diet safe for cats? As is the case with people, it is very uncommon for cats to have a gluten allergy. However, if a cat without an allergy lacks gluten in his diet, it’s not necessarily an issue. It’s far more important that your cat receives an animal-derived protein as the main source of his diet, as cats are primarily carnivores. As the name suggests, a grain-free diet excludes all grains. Unless you have a true grain allergy (which is rare), nutritionists caution against leaving all grains out of your diet. For instance, going grain-free means cutting off a huge source of fiber—a key nutrient in combating a range of chronic diseases. Is a grain-free diet safe for cats? Grain-free cat food is all the rage lately. In reality, there is little to no data to support the idea that grain-free diets are better for pets—it’s a marketing ploy. In fact, many grain-free cat food is made with starch from potatoes or lentils and may be higher in fat. If you cut grains but increase calories, your pet is going to gain weight. A raw food diet requires eating raw fruits, vegetables, and grains. The diet follows the idea that heating food destroys its nutrients and natural enzymes. (Nothing above 118 degrees!) Most people who eat raw foods also exclude animal products. Is a raw food diet safe for cats? A raw food diet for cats is typically different than it is for humans: It would be more apt to call this the “raw meat diet.” Advocates say it is the “biologically-appropriate diet” for cats, since it closely mimics what a cat would eat in the wild. But many cat owners don’t realize that raw meat containing E. coli, salmonella, or listeria will sicken a cat, just as it does people. Therefore, this diet requires extensive prep work by pet parents, including lots of sanitizing. Talk to your vet before switching your cat to a raw food diet. The ketogenic diet is a low-carb, moderate-protein, high-fat diet. The reduction of carbs is said to make your body more efficient at burning fat for energy. Therefore, someone following the keto diet should avoid sugary foods, grains and starches, fruit, beans and legumes, and alcohol; and they should instead focus on meat, fatty fish, eggs, butter and cream, unprocessed cheese, nuts and seeds, and low-carb veggies. Is the keto diet safe for cats? As with many of the fad diets on our list, some aspects of the keto diet are ideal for cats and others aren’t. Cats don’t need many carbs, and they do need a lot of meat—but the keto diet doesn’t discriminate between lean, healthy meats and red meats high in saturated fat. Furthermore, cats don’t need butter and cream, nuts and seeds, and other sources high in saturated fat. Intermittent fasting may help with weight loss and improving metabolic health. There are several variations of IF, including the following: 16/8 method, or fasting for 16 hours a day and eating your meals during the 8-hour window; 5:2 diet, or eating normally five days a week and restricting calories to 500-600 on two days of the week; and Eat-Stop-Eat, or doing a 24-hour fast once or twice a week. Is intermittent fasting safe for cats? Well, this largely depends on the length of the fast. Ideally, adult cats should be fed 3-4 small meals per day or 1-2 medium-to-large meals per day. In extreme cases, a starved cat will develop hepatic lipidosis, known commonly as “fatty liver,” which can lead to various complications and eventually death. On the whole, avoid fasting with your cat. Now you know: Fad diets for humans don’t really work for cats. If you’re interested in learning more about how compatible your diet is with your cat’s, check out our post on which human foods are safe for cats. And if you want to help your cat lose weight, learn how to exercise an obese cat. Next Post The Five Love Languages: Which Does Your Cat Speak?